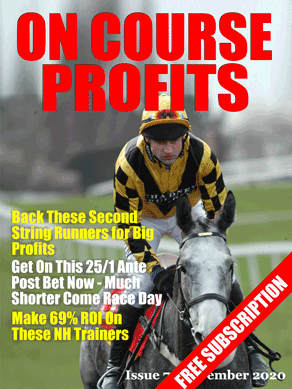 Michael Wilding's Puntology Pro Punter course goes live today and is only open for a few days. The first lesson features a ratings method that will get you started with profitable betting immediately. There is also a video walk through of this first lesson to make sure everybody gets up to speed quickly. If you have ambitions to make serious money from your betting then this course is highly recommended. Click Here for full details of the course and the bonuses. Back in April I had an idea for a winning system. I can't remember where the idea came from, but most likely it was from something that I read. Horses that are running off of a lower official rating today than they did last time should win more than those that have a higher mark. Although many might think that this means the horse is losing ability and is on the decline, the fact is that trainers spend a lot of time trying to get the OR of their charges lowered. I spent some time researching different handicap marks to find where this idea might do best. Today I'll share one of those systems with you and (er) show you that finding winning angles in past results is no guarantee of future winnings. In fact this may become a new lay system such has been the performance since April. Now first I should say that this is a National Hunt system, so it may be a summer off season thing, although past results show profit in the summer. The profits at the time I researched this were not great and luckily for that reason I decided not to include them in my bets, the return on investment was 8.5%. Since I created the system there has been a loss of 58.93 points & -44% ROI. The key thing to take from this is that when you research a system that you should test it on a separate set of data to see if the idea stands up. Although I try hard not to back fit systems we are looking for the best results from past data. This system is a reminder of the dangers of backfitting. And a reminder that we should always check a bought system has been tested live somewhere before we pay money for it. Next step with this is to decide whether we can lay these selections, that decision is a way down the line yet as I want to see more live results and may want to tweak it towards more losers. IE I obviously looked for the most profitable courses originally whereas if I'm thinking of laying these then I want to look at negative aspects. Following on from my post the other day about big priced selections and specifically Dave Bicknell's Golf selections, today I have for you Dave's full analysis and selections for the McGladrey Classic which tee's off at 12.35 today. Don't forget to check out http://proballclub.co.uk/ for full details of Dave's selections and his past results. The Pro Ball service is £50,000 in profit this year to £100 stakes and is the perfect service if you are looking for a balanced portfolio with plenty of action. We travel this week to georgia and the Sea side course sea island is our home for the week. This is a well respected venue used as a practice course for many pro's who are resident in the area. Sea island golf club is a ocean side links course thattests all aspects of your game . It's exposed so any sea breeze can become a factor to how you approach this test. It's just above the 7000 yard mark and is a par 70 that will require accuracy to the undulating fairways protected by marshland,waste areas and large fairway bunkers, you will require course management and precise approach play to the fast putting surfaces as well as the ability to scramble and deal with any costal conditions. The weather for this week looks to start well with winds estimated between 10-15 mph the weekend is a little tougher to call but predictions are for no major change. ZACH JOHNSON Is a local resident who knows the course well his accuracy and great short game touch make him a must pick, he did miss the cut last year but was involved in a lot of off course work through out the week , he will be returning from a two week lay off after the ryder cup so is well rested, his two wins this year also came after two week lay offs. J FURYK Is only missing a win he has constantly put himself in position to close this year and although tasted disappointment he is becoming more like the player who won the fed ex cup and will turn these chances into victories, it's a week field and he also is returning after a couple of weeks rest , expect an in form furyk who is made for this course 11th here last year. J DAY Is another player trying to get back to the heights he once occupied , he has four top tens this year which by his standards is poor and i must admit his odds are not very generous but its what he did last time out at the Justin Timberlake event that has me interested, all four rounds were in the 60's , he finished the weekend with rounds of 64,65 (that included a double bogey finish) and he birdied 7 of his first 9 holes taking just 10 putts , jason has been up and down this year with his eye off the ball maybe caused to his new edition in the family but when a player gets that hot making birdies and holing putts you have to take some notice , this could be a kick start to something more. B ADAMS Has popped up in a few places this year playing some great golf but not getting all he deserves, now in the fall series he has a real chance in weaker fields to reap some rewards. Took a week off after finishing 8th at the Timberlake making 18 birdies and an eagle , this isn't a one off with him lying inside the top 50 for par breakers , he's local and has made the cut the last two years not playing anywhere near his current form. G CHRISTIAN Missed his first cut in eight events last week after a poor first round , he did bounce back with a nice 68 and will look to continue some excellent form into this event , the course should be right up his street short par 70 with course management a premium , he has great GIR stats and also will compete from 100 yards in only thing holding him back is a sometimes cold putter . D MATHIS Just inside the top 125 so he needs a big week ,great putter who finished just outside the top 20 last week , finished 15th last year and will look at his strokes gained putting stats and excellent approach play from inside 100 yards to figure big , as with a lot of players he knows how important this tournament is for guaranteed starts next year, he;s responding well to the pressure and i see him taking care of business this week. MATT'S HAD GOOD RESULTS HIS LAST TWO EVENTS AND APPEARS TO BE TAKING ADVANTAGE OF SOME FULL TOUR STARTS , FINISHED LAST WEEK PLAYING WELL. JEFF IS ANOTHER IN FORM PLAYER ON THE EDGE OF RETURNING TO HIS TOP FORM, CLOSE TO BEING AN E/W PICK THIS WEEK. Pro Ball Club members also have selections for the Perth International as well as football and racing bets.